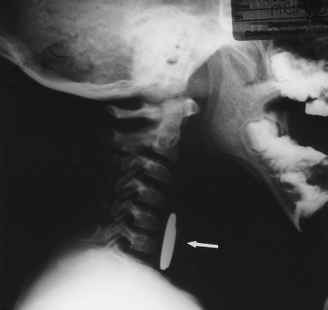 Figure 19-2 Lateral neck x-ray film of a child presenting with gagging and drooling, showing two coins (arrow) in the esophagus near the cricopharyn-geal junction. the gastroesophageal junction, and the area of indentation of the esophagus by the left main stem bronchus and the arch of the aorta. Coins are by far the most common objects found in the esophagus in children. Chicken or fish bones are more common in adults. The diagnosis of an esophageal foreign body is primarily based on the medical history and physical examination, with the aid of radiologic studies. Parents might witness ingestion of the foreign body and subsequent coughing, gagging, refusal to eat, or drooling. 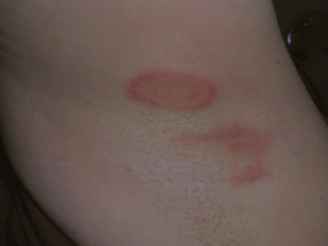 Often, however, the incident goes unwitnessed, and reliance on other diagnostic techniques is necessary. Plain radiographs (including lateral films) are often diagnostic in pediatric patients because most esophageal foreign objects are radiopaque (Fig. 19-2). Other radiologic findings that can suggest a foreign body include increased soft tissue density in the prevertebral space, mediastinal widening, air-fluid levels in the esophagus, and paraesophageal air. Disk batteries require a high index of suspicion because they can cause significant tissue injury and lead to esophageal perforation if they are not removed emergently. They have a classic appearance when viewed laterally, approximating a dime resting on a nickel (similar to the appearance of Fig. 19-2). If there is sufficient evidence of an esophageal foreign body, ENT consultation is indicated for rigid esophagoscopy and removal. When radiolucent objects have been ingested, contrast esophagography might be indicated, although esophagograms can give a false-negative result and can also complicate visualization during rigid esophagoscopy.